I am sure all of us would recognize this 404 page and would have encountered it at least once during our browsing experience! Ever wondered what it is? The 404 page is that error page you see when you attempt to follow a broken/dead link. The HTTP 404 Not Found Error means that the webpage you were trying to reach could not be found on the server. It is a Client-side Error which means that either the page has been removed or moved and the URL was not changed accordingly, this can even happen when you type the URL incorrectly. 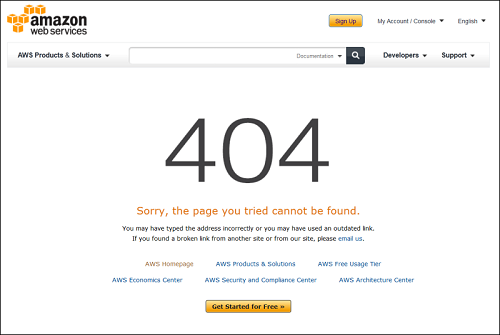 In short, a 404 Not Found Error means that the webpage simply does not exist with the URL entered. Does it affect my SEO rankings? In simple words, when a link redirects users to a page that returns a 404 error, Google recognizes that the page is no longer available and removes it from their search index thus affecting your SEO and rankings. There are 2 awesome ways of using your 404 error page for good. Use a 301 redirect - It will permanently redirect one URL to another. The 301 redirect sends visitors from the search engines to a different URL than what was originally entered. Create a Custom 404 page - Customize a page of your brand and add all the links that you would want your visitors to checkout. You can add a search bar, add links to the products etc. the possibilities are endless. Doing this will not only keep the visitors engaged but would also give you a chance for them to check out additional content! A customized 404 page as seen in this screenshot above would definitely give your visitors a better experience than what a generic one would. All in all, error 404 cannot be completely eliminated but you can definitely manage it resulting it to cause no harm to your SEO. We hope you find this helpful! Please feel free to drop us a message to know more and we will be happy to help!